This sounds like an interesting project. I would definitely be interested! I can help you with adding effects to this jet. Thanks Raptor! What kind of effects do you like to do? I have only done the Bristol Freighter project so far (see forum thread) and it is still in early development so I have not done too many effects. I am quite comfortable with the particle system for airshow smoke and wingtip vortices (and engine startup smoke on the Freighter. However I have not yet worked with glass or material effects. 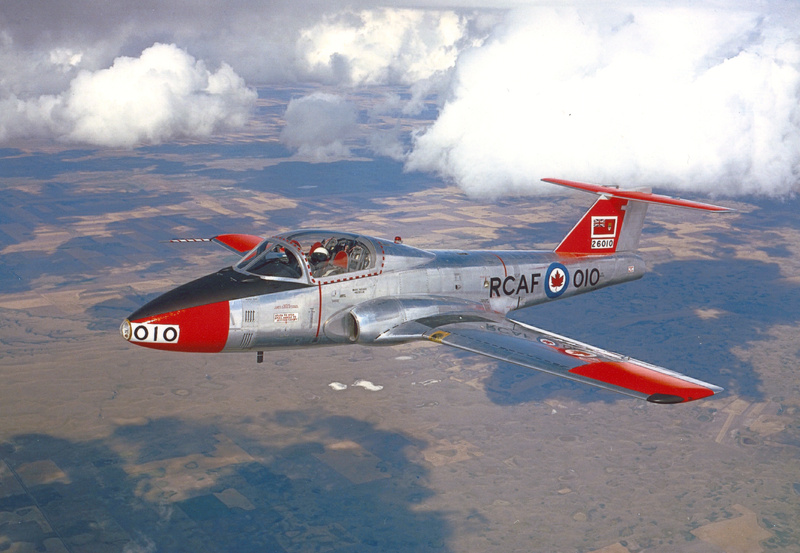 I really like the stock training paint scheme on the Tutor, which has a lot of bare metal surface. I wouldn't mind help with getting that looking nice, like the P-51 in FG. Also the cockpit mirrors, I'm not sure if there is a way to get those to work properly yet or not? Canvas? I searched the forum on that topic a few years back and saw people asking about it but no firm solutions. I have done an interim texture mapping for the Freighter with some liveries, but not a proper paint kit with AO etc yet, but I am quite comfortable with Gimp from my photography hobby so I don't anticipate a problem here. 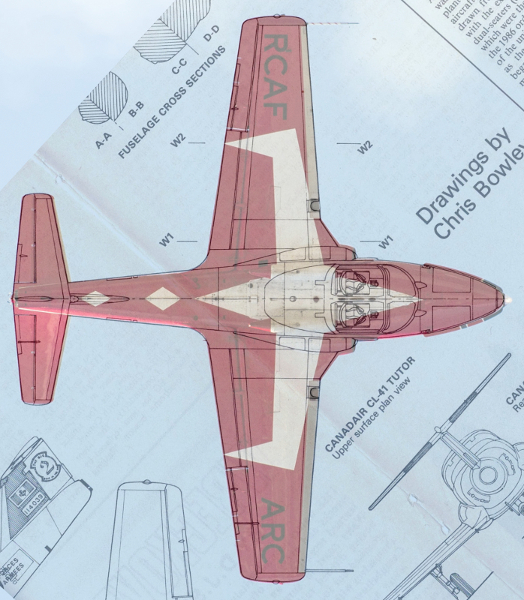 Texture mapping will be interesting because it will need to take into account several paint schemes including the Snowbirds that have one continuous pattern across the bottom of the wings/fuselage, and the training scheme which includes the red/white striping on the windshield frame. 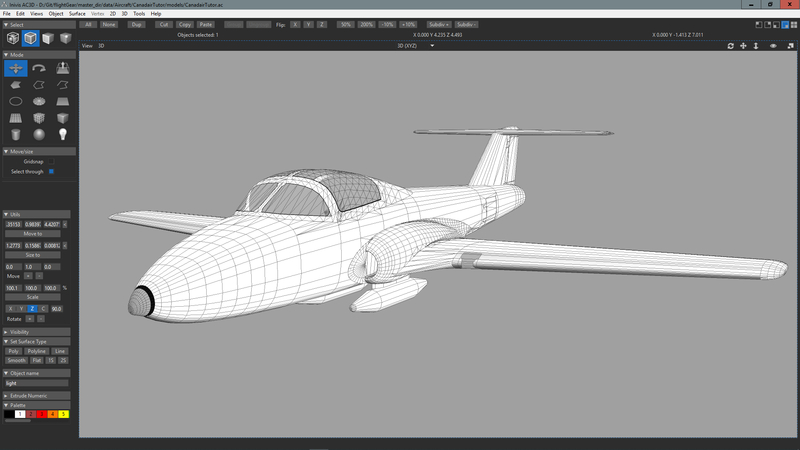 So I won't be able to do a simple side projection for the fuselage. I will likely do the texture in a higher resolution and offer a smaller resolution for users with less powerful machines. 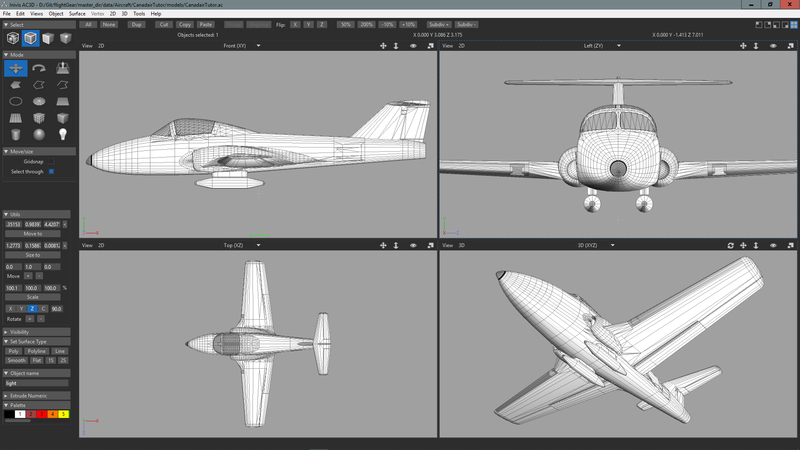 I might even go to 4096px for a relatively small aircraft, even if I just use it for screenshots. Any input you have would be much appreciated, I am still learning a lot but loving every new challenge! Very excited to try and give feedback! I have completed the high level exterior modelling. 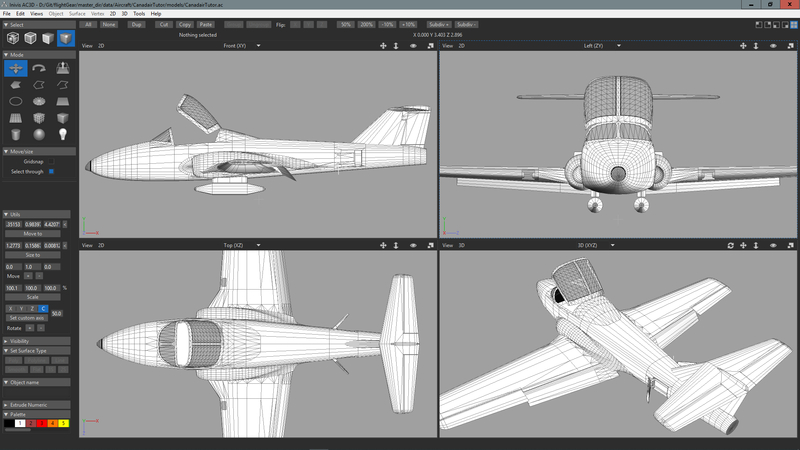 You can see the progress in interactive 3D at http://flightgearcanada.altervista.org/aircraft/index.html, just expand the CL-41 Tutor by clicking on the aircraft icon, then click "View in 3D"
Landing gear will be next, then I will take her up in the sim.